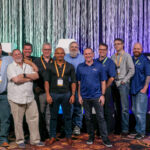 This video is part of the appearance, “NetApp Data Fabric and Cloud Volumes Presentation at Tech Field Day Extra at NetApp Insight 2018“. It was recorded as part of Tech Field Day Extra at NetApp Insight 2018 at 14:30-15:30 on October 24, 2018. Eiki Hrafnsson, Global Architect Data Fabric, demontrates the cool new features NetApp is developing to orchestrate, manage and monitor cloud storage on NetApp Cloud Volumes and public cloud services like Google Cloud Platform, Amazon AWS and Microsoft Azure.